Virtually all analyses that I have encountered in the mainstream media on the Tunisian and Egyptian democracy uprisings have emphasized material causes: poverty, widespread unemployment, food prices, lack of political participation, corruption, denial of human rights, oppression, torture and so on. These may be grounds for deep grievances. But they do not explain the sweep of national nonviolent mobilizations across the Eastern bloc and into the Soviet Union, starting in 1980 with Poland. They do not explain the Israeli and Palestinian joint committees that worked together to develop new symbols starting in 1981, and which became the first harbinger for the 1987 Palestinian intifada. They do not explain the decade-long U.S. civil rights movement. Indian resistance to colonial rule was strong throughout the 19th century; more than 100 peasant revolts were politically shallow and easily suppressed. Yet it was not deprivation or colonial exploitation that caused multiple, multi-decade independence struggles to unify virtually the entire Indian population in the early 20th century. 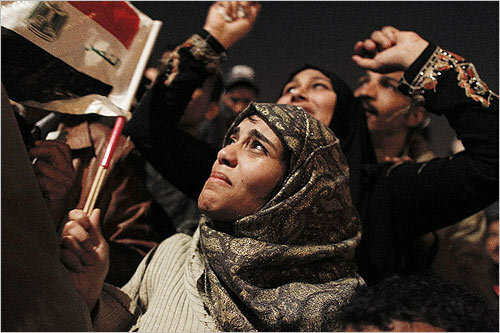 Tunisia and Egypt’s upheavals were years in the making, as are all national nonviolent revolutions that I’ve studied. Many tragic events had transpired, but had not set off a national movement. Not only does suffering not explain the emergence of a movement, what may trigger a mobilization in December or January may not have had any effect in months or years earlier. The ability to build cross-cutting broad coalitions. Numbers count, so breadth of appeal is important. Alliances encourage pluralism, inclusivity, and are emboldening. Closely related is the capacity to empower ordinary people. Facility in spreading information. Whether through houses of worship, the clandestinely circulated materials of the Eastern bloc national mobilizations, or by electronic means, all nonviolent movements use the latest technology for dissemination of knowledge on how civil resistance works, or sharing information on the latest inexcusable excrescence. In Eastern Europe, the covert distribution of samizdat (Russian for self-published) underground publications played a critical role in the democratic transitions. Beware the facile Twitter explanation. At the most fundamental level, clear communications about the grievances and the goal and objectives of the mobilization is essential for successful nonviolent action. If you want someone to stop doing something, or start doing something, you must be able with clarity to put across your ideas, aspirations, and demands. This is why logos, symbols, slogans, and motifs are so critical in civil resistance. A people’s ability to envisage or foresee an alternative to the continuance of oppression. In other words, a belief that popular action might be effective, a conviction that history can be made by ordinary mortals and not solely economic and martial forces—human agency. The extent of free-standing civil society organizations with independent leadership, which can provide a corporate capacity for mobilization. Dispersed or diffused centers of power lay the basis for broad resistance and social movements. Effective action requires varying institutions in a society that can provide constraints on the target group’s sources of power. Fragmentation of authority goes with diffusion of the centers of power, which help to elude interruption and generate independent leadership. An ability, or opening, in which civil society groups can capitalize on the political vulnerability of the opponent. The chance to seize a moment when the opponent has revealed its indifference and cruelty, or the ability opportunistically to raise the costs of its continuing repression. A perception of the weakness of the target group. The degree to which groups or organizer intellectuals who can act as interpreters have learned or studied the basic theories and methods of the technique of nonviolent civil resistance. In the civil rights movement, we had little in print. The sharing of knowledge took place by word of mouth, by professionals who had traveled to India and met with participants in the independence struggles. Today, basic works and case studies by foremost scholars and theoreticians are freely available for download in dozens of languages. Activist intellectuals in today’s societies can change the frames through which old grievances are viewed. Something endured for decades can be re-framed as now amenable to popular defiance. A willingness to include the opponent in the envisioned future can help to break the ranks of the opponent’s security services or police. By refusing to allow an “us” and “them” polarization to develop, a bridge can be laid for the security services to cross over to the side of the nonviolent challengers. Perhaps most importantly, the degree to which there exists a latent or explicit understanding by the guiding thinkers, or a popular appreciation, that no system can continue or succeed if the people cease to obey or cooperate with it. All of these factors were present and operative in Tunisia and Egypt in 2010-2011, in varying degrees of intensity and pervasiveness. I have not mentioned the charismatic leaders that are supposedly required of nonviolent movements, because I find little evidence of this phenomenon as a factor. More typically, movements thrust forward the leaders that exemplify their quest and raise up those who personify their emerging mobilization. Effective spokespersons must sometimes materialize rapidly, even if they must stay nameless or faceless in movements that are obliged to remain clandestine to survive. I would rank all of these factors as more important than the exact nature of the underlying fundamental material grievances that so dominated the analysis by the North American and European news media. We do not yet know the eventual outcomes in Tunisia and Egypt, although we do know that the more advance study, planning, and preparation the better. Poorly planned, improvisational mobilizations have historically led to coups d’état or merely opened the doors to a new set of thugs. Analogies to Iran and Gaza are utterly misplaced. If you want analogies, look to the Eastern bloc. Educated middle classes of today’s societies can make judgments about ethics, principles, values, and basic rights based on a wider framework of analysis than those with little education. The artistic and literary activist scholars who addressed their work and communications to these middle classes in the Eastern bloc helped them to comprehend the corruption of the system, and hence played a major role. They needed receptive listeners and readers, but their work unraveled Eastern European communism. There, as in North Africa and on the Nile, movements grew from the broad numbers who came to see through the lies on which whole systems of patronage were based. I noticed a website yesteday that seemed alot like this, are you sure a person isn’t copying this site?